On Sunday, September 27th, we celebrate the history, the politics, the culture, the personality and the community of Crenshaw with a bike ride of discovery and celebration. Join us and visit beautiful neighborhoods, significant community spaces, historic sites, local favorite hot spots, institutions of knowledge, and the homes of heroes and legends. Dust off your bike, bring the family, get there at 8am for bike tune-ups, the ride starts at 9am. There will be pit stops with hosts, who will share stories of their neighborhood. For those who want a challenge, there will be a poker ride with some miles and some hills. Both casual and competitive cyclists are invited to join in a celebration of the community. --Meet @ Crenshaw Blvd. & Vernon Ave. 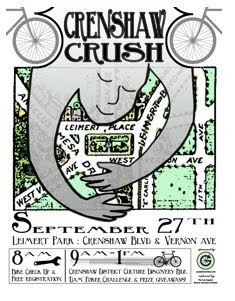 The Crenshaw Crush starts at the Leimert Park Village Drum Circle and heads off to Florence & Normandie where the most destructive American riot of the 20th century broke out ten years ago. The ride visits Exposition Park, stops at Chef Marilyn's Soul Food Express, and passes Susan Miller Dorsey High School, named for the first female superintendent of the LA public school system. Traveling along the Exposition Light Rail Transit Line, cyclists will visit Village Green, also known as the Olympic Village, and then will ride over to the Baldwin Village, also known as "the Jungle." It's rumored that Magic Johnson will take a lap or two with the group around his Theatre before cyclists visit the Baldwin Hills Crenshaw Plaza which is the oldest regional shopping center in the country. Father Martini of the Transfiguration Catholic Church is waiting to bless the cyclists and will then join the ride which will visit the Leimert Park Homes, designed by Olmsted & Olmsted, the architect and master planner of New York City's Central Park. Restricted to white residents until 1948, notable residents include John Singleton, Ray Charles, Ella Fitzgerald and former Mayor Tom Bradley. The ride ends at the beginning, the Leimert Park Village Drum Circle. The Crenshaw Crush … because in some vernaculars crush means: Big Hug. It must be tough to buy a gift for LA's Department of Transportation. Caltrans tried but the gift was rejected. At the very least, the LADOT could have just accepted it and then rewrapped it and regifted but instead they just straight up said "No!" It's enough to make one wonder if Caltrans will be sending gifts to the LADOT anytime in the near future. At issue are the bike lanes that Caltrans funded and engineered and wrapped up with a bow and tried to have delivered to the City of Los Angeles. Topanga Canyon Boulevard runs through Woodland Hills in the West Valley and is also known as California State Highway 27. It belongs to the State of California and Caltrans is responsible for it but, as is the custom, defers to the local authority with regard to improvements and integration into the local transportation system. Doug Failing, Director of Caltrans District 7 which includes Los Angeles County and Ventura County, was the featured speaker at a Great Streets Forum held last year in Woodland Hills. Hundreds of people turned out for inspiring presentations and discussions of Great Streets and how they are designed, the features that make them great, the designations that bring them to fruition. A member of the audience who lives close to Mulholland Drive asked what it would take to make Topanga Canyon Boulevard a Great Street. Mr. Failing responded by describing a street with open setbacks, wide sidewalks, parkway separation, bike lanes, traffic lanes and a median strip with shade trees and greenery, all delivered in a way that integrates with the activity of the local community as the boulevard weaves through the west valley. The room erupted in applause. Pat Smith, the Urban Planner who has been working with the Warner Center Specific Plan was there and when she takes notes, she simply draws what she hears. The person sitting next to her watched her sketch the "reimagined" Topanga Canyon Boulevard and said quietly "I'm going to Art School!" Caltrans embarked on a local improvement campaign and, as guided by the City of Los Angeles Bike Plan, an element of the Transportation Plan which in turn is part of the General Plan, generated the money and the engineering for Bike Lanes on Topanga Canyon Boulevard. The Bike Plan calls for bike lanes on Topanga Canyon from Mulholland Drive to CA State Highway 118, a distance of about 9 miles. That's a fairly significant bikeways improvement and a significant connector in a densely populated area. 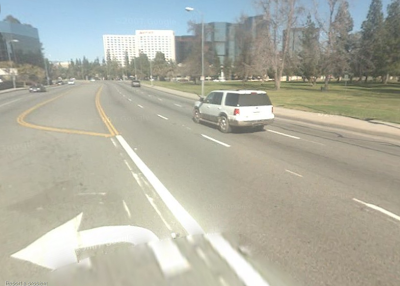 The LADOT's traffic engineer in charge of the west end of the San Fernando Valley is Ken Firoozmand, a legend in Valley Bikeways Improvements who has been in the news lately for interupting the development of the Reseda Boulevard Bike Lanes. Again, the Bike Plan called for bike lanes on Reseda but as the local LADOT authority, Firoozmand overruled and determined that the area would benefit from peak-hour parking instead of the bike lanes. A report was generated that indicated the bike lanes were not going to happen and the cycling community stormed the local Neighborhood Council, wrote letters, made phone calls and Allan Willis, LADOT's Principal Transportation Engineer for Valley Traffic Operations dismissed the whole brouhaha as "trash talk." Councilman Zine dismissed the concerns of cyclists as based on rumor. Councilman Smith was simply silent. Then the "Report" turned up and the Bike Lanes were back in play. As the cycling community engaged in an end-zone victory dance, the LADOT was apparently in the clubhouse toasting Firoozmand and Willis, giggling at the gullibility of the cycling community, and plotting the next evisceration of LA's moth eaten Bike Plan, due to be replaced with a newer "Infeasible" Bike Plan sometime between last year and never. My simple question to the LADOT is this, if you're not going to use those Topanga Canyon Boulevard bike lanes, can I have them? I'd like to put them to work and it seems a shame to have them go to waste! I can think of so many great places to place 9 miles of bike lanes. The City of Los Angeles is in the middle of a budget crisis, something the public hears about at every opportunity as the newest excuse for mediocrity becomes part of the bureaucratic vernacular. It's times like this when the best thing community members can do is to step up and to lighten the load of the overworked and underpaid municipal workers who must also grapple with long commutes to their own communities. This is when Government 2.0 takes over, the time when folks simply make it happen and that is the simple mandate of the Department of DIY. The City of Los Angeles is pleased to announce the future home of the Alprentice ‘Bunchy’ Carter community park in collaboration with Park[ing] Day and their vision of a greener, brighter, more democratic Los Angeles. Amenities will include permit-free vending, a skate/bike park, community garden plots, farmers market, jogging path and sports field. There will be AA, Crafts, Senior and Nutrition programs. LA's Department of Water & Power has dusted off the Holiday Light Festival decorations and is busy investing the public's money in the event that won the "Eco-Moron" award last year for its ability to drawing idling vehicles in such numbers that Griffith Park, the adjacent communities and the 5 freeway all sit in gridlock for hours each evening of the holiday season. As the Park Rangers and the Department of Transportation grapple with the traffic, the DWP claims the "Going Green" title and then proceeds to go after more of your green. The Griffith Park Holiday Light Festival is an old tradition, dating back to Councilman John Ferraro who visited San Antonio during the holiday season and came back all enthralled with the idea of a public light festival. In hindsight, it's only too bad that he didn't visit a city with Great Streets, one with holiday lights and people walking and talking and having conversations and singing and enjoying a human-sized people based festival. Of course, it's not too late to make some changes! The Greater Griffith Park NC, the Atwater Village NC, the Los Feliz Improvement Association, the Oaks Home Owners Association and community members representing hikers, runners, cyclists, equestrians, and folks who simply like to breath clean air when standing in the middle of the America's largest urban wilderness park have joined together to ask the DWP to simply have motorists park their cars in the Zoo parking lot, then get out and walk through the Festival. The simple move to a pedestrian based festival, with ADA accommodations, would relieve the community from the idling queue that approaches the park from the south. It seems so simple! The DWP's Public Affairs office, very nice folks who have one of the hardest jobs imaginable, putting a shine on the DWP's policies and programs, gave this year's version of "Why you can't have what you want but here is something shiny to distract you!" presentation, again to a full house and again to well-articulated arguments for the same old vehicular based paradigm for enjoying the great outdoors. The Bike Writers Collective objects to the DWP's Griffith Park Holiday Light Festival for a few reasons, first because it excludes cyclists from the vehicular nights based on the recommendation of the LADOT that it is too dangerous to have motor vehicles and bicycles on the same road. This becomes a principle issue since one of the basic rights cyclists claim is the right to ride on the streets of Los Angeles. The DWP claims that it is exempt from the law and can exclude cyclists which leaves cyclists charging "The DWP is trying too hard to find a legal loophole to do something absurd, prevent cyclists from riding bikes in traffic that moves so slowly, the road resembles a parking lot." Plans are already underway for a protest ride, The Festival of Rights, which will take place on Friday, December 18. The protest ride, which gathers at the Mulholland Fountain where cyclists decorate themselves with lights, has become an annual tradition and this will be the third year (2007 and 2008) that the absurdity of a vehicular light festival at the expense of the community, the pedestrians and the cyclists will be challenged by the cycling community. Cyclist should be cautioned that the ride is not without risk, participants who elect to breath while riding will be subjected to greenhouse gases, auto emissions and noxious odors. As for the larger issue of the "Pedestrian Friendly" event that local community leaders have been proposing, endorsing and working to bring to fruition, the DWP Commissioners, the DWP Management and Councilman Tom LABonge have all been notified that the Greater Griffith Park Neighborhood Council has polled the community and concluded with a resolution calling for the "complete environmental reform of the annual LADWP Light Festival in Griffith Park." 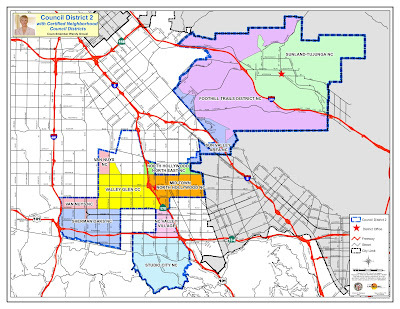 Today is election day here in Los Angeles and the residents of Council District 2 will be voting in a special election to select a Councilmember to fill the seat vacated by the former Councilmember Wendy Greuel when she was elected as LA's City Controller. LA's Cyclistas will remember Greuel as the chairperson of the Transportation Committee, a fairly jovial group of people who endorsed the Cyclists Bill of Rights, reorganized the Bicycle Advisory Committee, repealed the Bike Licensing Law and jumped up and down and made the appropriate noises when we Stormed the Bastille. Ah, this has been such a great year! Today, the mix of power shifts ever so slightly but possibly significantly. It all depends on the voters. Los Angeles has a Mayor and a City Council made up of 15 Councilmembers. A significant number of those in office are lame ducks, politicians in their last term who can't run for reelection. The person who wins the CD2 seat is in a position to set the tone for the next round of candidates who run for the even numbered seats in 2011. That's seven seats and the person who wins today will be setting the pace for that race. As for today, there are ten candidates and it's a bit late to try to cover the many issues and the many positions and the many debates and the many forums. Suffice to say that there are two kinds of candidates, those who embrace the Cyclists' Bill of Rights and those who don't. Allow me to present video comments from four of the candidates followed by text from two of the candidates. Of the remaining four candidates, they had their chance, they had their opportunity, they missed out on the Cyclistas of Los Angeles and that's on them.. The most elegant solution to L.A. traffic is simply to pedal to where you need to go. If cycling is not for you, at least give some respect to those who choose to ride. Here's why: Cyclists are the "indicator species" for a healthy community. Cyclists favor well-maintained streets free of potholes and debris. They prefer streets with moderate vehicle volumes and speeds, an environment that is likewise safer and more hospitable for drivers and pedestrians. Surveys in San Francisco found that local businesses benefited from "traffic calming" through their districts, which included accommodations for cyclists. Finally, an increase in the number of cyclists in a neighborhood -- which means more eyes on the street -- has a direct relationship to a reduction in crime. In other words, what's good for cyclists is good for your community. Q: One of the ways that a City Council Member can effect change for non-motorized users is by appointing informed activists to the city's Bicycle Advisory Committee and Pedestrian Advisory Committee. Are you familiar with community activists who could best serve an appointed position on these committees? A: I consider Stephen Box to be my advisor on these issues and would surely appoint him to Transportation, or recommend him in advisory capacity if given the chance by the voters. I would also consider Stephen to be on the staff for CD-2 if he was interested. Should he desire to remain an unpaid adviser, better for the city budget, but I personally think his input and dedication are worthy of a city salary. Q: One of the ways that a City Council Member can effect change for non-motorized users is by appointing informed activists to the city's Bicycle Advisory Committee and Pedestrian Advisory Committee. Are you familar with community activists who could best serve an appointed position on these committees? A: Yes. During the last several months on the campaign trail, I have had the pleasure of meeting so many activists who care so much about the future of our community. This includes the indefatigable Stephen Box who educated me about the importance of the Cyclists' Bill of Rights, of which I am a supporter. 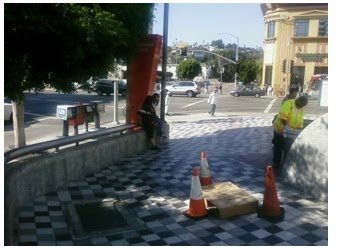 Tuesday's City Watch article on the jurisdictional disconnect and the blight at the Hollywood & Western Red Line Station prompted a fast & furious response from the Metro's CEO, Art Leahy, who has only been in his post for a few months but who has gone on record as saying public safety and customer service are the priorities for the Metro on his watch. His performance was true to his word. Leahy responded immediately and within hours, the Metro's Head of Rail Operations, Mike Cannell was on the phone, collecting details and that evening team of maintenance workers swarmed the Hollywood & Western Red Line station with industrial scrubbing machines, truck mounted steam cleaners, hoses, scrub brushes, mops and an abundant amount of old-fashioned elbow grease. When the steam had cleared, Cannell led a team of a dozen Rail Execs on a victory tour of the facility, accompanied by the LASD's Red & Gold Line Supervisor, Lt. Sue Young. Mitch O'Farrell and Angela Motta of City Council President Eric Garcetti's office joined the survey and it was apparent that, at least for a couple of hours, Hollywood was again the center of the Universe. Over the two day period that followed the City Watch article it became painfully apparent that there was a real problem. Capt. Bea Girmala of the Hollywood PD didn't visit the location but instead sent Sgt. Tango who gave his impression of the jurisdictional boundaries, an opinion that was promptly contradicted as the Senior Lead Officer, Armen Sevdalian showed up and made his declaration. Lt. Young walked the property and was joined by Sgt. Walker, the lead officer for the Red Line, and they agreed that the boundaries were irrelevant, they were law enforcement officers and they believed it was there responsibility to enforce the law. Young was a commanding presence and I have no reason to doubt her but the fact remains, it's the boots on the street that give weight to her words and we don't see those boots or their influence much in Hollywood. The Metro has a $67 million dollar contract with the Sheriff's Department. It's the LASD's second largest contract, after the judicial system contract, and it should count for something. One would think that the Metro would be in a position to call the shots, to direct the LASD, to set the priorities but this is where the disconnect starts. Are the priorities fare evasion or public safety/customer service? Are the staffing levels set for rush hour priority or are they set for late at night when stations are lonely and deserted, hospitable environments for those who favor isolation and neglect? Is Hollywood, with a half dozen stations and huge volumes of traffic, getting its fair share of supervision? While those macro questions work their way through the process, the immediate opportunity was evident, McCormack Baron, the property managers, had never given the LAPD or the LASD a simple Trespass Authorization Letter, a routine bit of business that allows the LAPD and the LASD to enforce trespassing violations without having to wait for the Property Manager to complain for each incident. With a straight face, Mirna Mendoza, the Area Manager of McCormack Baron, said she had no idea that the letter was needed and then proudly stated that she has them on file for all of the other properties she manages. Both the LAPD and the LASD left her with a request for Trespass Authorization Letters. McCormack Baron is not new to the property development and management business but one would have to wonder if they are any good at it. The Hollywood and Western location has two street level vacancies that have been empty for seven years, ever since the Metro Hollywood building opened. The Neighborhood Council has extended a request to open one of them as a community center, an office for the NC that would have desks for the Senior Lead Officer, the community partners that offer services, the non-profits that work to improve the quality of life in the neighborhood. This would keep a presence in an otherwise deserted area of the property, but those requests have fallen on deaf ears. Instead, the homeless encampment flourished and the area developed a reputation as the place to score drugs. Metro Hollywood is a CRA project and the CRA is again working with McCormack Baron which makes one wonder what criteria is used to evaluate the potential multi-million dollar development relationships the CRA relies on as it spends our money to address blighted communities. Mayra Rivera, the CRA's representative for Metro Hollywood, was non-committal and deferred to the CRA's development partners when complaints over the developers failure to perform came up. The CRA is actually the tenant for one of the empty spaces, a space that sits empty while the responsibility hot potato get shuffled back in forth. In all fairness to McCormack Baron, they have bigger fish to fry and Hollywood is way off the radar. The CRA's glowing endorsement of McCormack Baron has resulted in another project, Taylor Yard Transit Village, which comes with a check for $15,094,990. This money is to be used to develop a "Transit Oriented Development" and based on their success at Metro Hollywood, McCormack Baron is moving on, funded with our money! Meanwhile, at Hollywood & Western, the flurry of activity included Metro executives, LASD supervisors, LAPD supervisors, CRA supervisors, McCormack Baron supervisors, City Council President Eric Garcetti's Director of Constituent Services and Area Deputy, repeated contact from Mayor Villaraigosa's Transpo lead, Borja Leon, all of which resulted in one very clean and shiny Metro station. Missing from this huge response from everybody who has a piece of the Metro Rail is County Supervisor Zev Yaroslavsky. Emails and phone calls to the Supervisor and his staff went unanswered and there was no response from his Transportation Deputy. Yaroslavsky sits on the Board of the Metro and one would think that he would be interested in the $67 million contract with the LASD, with public safety at Metro Stations, with homelessness issues within his district, heck with having his staff simply answer his emails or returning phone calls. As you can see from the attached video, as Hollywood Makeover ended, the escalator is still out of order, the intercom is still out of order, the homeless encampment is still occupied, the human waste still runs freely and the Sheriff is nowhere to be found. The East Hollywood Neighborhood Council Board convenes on Monday night at 7pm. On the agenda is the Metro's Hollywood & Western Red Line station, an action item. East Hollywood NC has three Metro Rail stations within its boundaries, more than any other Neighborhood Council. Typically this relationship is celebrated and it should be. The Metro's Hollywood & Western Red Line station and the TOD Development that sits above it should be the catalyst for community revitalization, not the weight that drags it down and certainly not the source of the very blight that the CRA is meant to address. CityWatchLA - Hollywood & Western - "No-Man's Land"
The Metro’s Red Line stations are all unique, each one decorated with public art that reflects the character and personality of the surrounding community. At Hollywood & Western, the Metro selected overflowing trashcans, human waste and a homeless encampment, all in tribute to the “No-Man’s Land” status of the area that finds the LAPD and the LASD treating the Metro station like a jurisdictional hot potato. This past Saturday evening, arriving at the Metro Station a little after midnight, we discovered five of the six escalators inoperative. Proponents of the "Broken Windows" theory would suggest that this "indicator" communicates a complete lack of oversight. Walking to the third staircase, we came across a little old lady, halfway up, standing still, unable finish the journey to street level. As my wife assisted the reluctant pedestrian, I went to notify the authorities only to find that the emergency intercom was out of order. At street level, the LAPD was out in force, driving up and down the Boulevard in vehicular insulation, never slowing down or so much as glancing at the Metro Station or the homeless encampment that sits below City Council President Eric Garcetti's 4th floor office in the Mayer Building. Of course, this is not their beat. Years ago the Metro awarded the Los Angeles Sheriff's Department a lucrative contract to provide law enforcement services for all Metro property. A subsequent Memorandum Of Understanding between the LAPD and the LASD clarified the jurisdictional details and the lines were drawn. All Metro property is the responsibility of the Los Angeles Sheriff’s Department. None of this really matters to the person on the street who wants help, only to find themselves lost in the "No-Man's Land" of the Metro Red Line Station. I called the LASD Watch Commander at Metro Rail HQ to let him know of the five inoperative escalators, the broken emergency intercom, the stench of urine and feces, the overflowing trash cans, and the homeless encampment, pointing out that they all indicate a significant failure on the part of the LASD. Sgt. Bedogne explained that staffing was thin on Saturday nights and that their focus was fare evasion. I pointed out this seems to be in sharp contrast with the Metro’s position as articulated by CEO Art Leahy who has indicated that public safety and customer service are his priorities for the Metro. It took 28 minutes for the LASD to arrive at Hollywood & Western, four cars with five Deputies. They descended into the station, returned to street level, chatted with the two armed Metro Officers who joined them, hung out some more, and then they all left. Net result of the visit, 22 minutes of scratching, spitting and huddling together on the mean streets of Hollywood and Western. At no time did any of them simply walk the perimeter of the street level property. Sgt. Bedogne explained "The LASD only handles the Metro Station itself, not the surrounding property." In fact, we discovered that night, the Sheriff's surveillance cameras don't even cover the third level of stairs. Meanwhile, Sgt. Lawrence, the LAPD's Watch Commander informed me that the Metro Station including the homeless encampment is the responsibility of the Sheriff's Department. Neither Watch Commander seemed alarmed in the disconnect between the two departments and both referred me to supervisors who were not available. This neighborhood has been in the news quite a bit lately. The LA Weekly has run a couple of great articles on the issues of homelessness and emancipated youth in Hollywood and in both articles the Hollywood & Western Metro Station is featured as the de facto drop in center for the under challenged and homeless youth of the area. As Garcetti and LaBonge engaged in the jurisdictional hot potato dance, the City Attorney and Building & Safety got involved and at the prodding of local activists, the properties were razed and the area was cleared of blight. 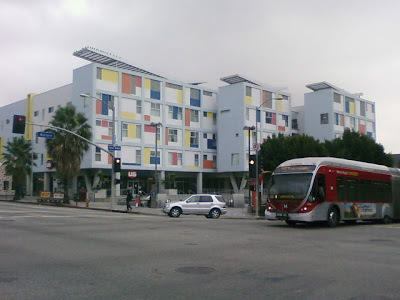 LaBonge, who has never passed on the opportunity to engage in an end-zone victory dance, gathered community leaders in the parking lot of the Rite-Aid to claim credit for cleaning up the neighborhood, missing the fact that destroying a squat doesn’t provide housing for the squatters, it merely drives them across the street into Garcetti’s district. Perhaps that was his strategy. It would be consistent with the behavior of others. The LAPD purportedly has professionals that handle homeless issues but according to Sgt. Lawrence, the Watch Commander on duty Saturday night, they are available during traditional office hours. The LASD also has professionals to handle homeless issues but according to Sgt. Bedogne, the Watch Commander on duty Saturday night, they are also available during traditional office hours. Somehow the collective oversight of City Council President Garcetti, Councilmember LaBonge, the CRA, the Metro, the LAPD, the LASD, Building & Safety, the City Attorney’s office and anyone else charged with addressing the homeless issue in Hollywood completely missed the fact that when you destroy homeless camps, you don’t reduce homelessness. The Sheriff’s Department is not without a plan for addressing homelessness. Ride the Metro Rail to either end of the line and you'll see Sheriff's Deputies whose only job is to make the homeless exit the rail cars, stand sleepily on the station for a few minutes with their abundant possessions, teeter and totter and then reenter to resume sleeping on the journey to the other end of the line. The LAPD has a similar strategy for the vehicles and motorhomes parked on residential streets, occupied by folks who simply move their vehicular campsite from one side of the street to the other to accommodate street cleaning, necessary to address the trail of trash and human waste left behind. The Senior Lead Officers typically use the 72 hour chalk to keep them moving in circles, ignoring LA Muni Code 85.02 which prohibits people from inhabiting parked vehicles on public streets. In either case, the strategy seems to be based on the belief that if the homeless are annoyed enough, they will simple grow weary of the inconvenience of homelessness, snap out of their stupor, resolve to prosper, buy a home in the Valley, and leave Hollywood behind. I’ve lived in Hollywood for a dozen years. I believe in Hollywood and I proudly refer to it as “the center of the universe,” a claim I make with utmost sincerity based on its history, its industry significance, its creative community, and its potential. For three years my wife and I have hosted “Bike to Work” events at the Hollywood & Western Metro Station. We have organized rides that use the Metro Station as the meeting place. Hollywood & Western is where we meet friends, where we shop, it’s often the beginning and end of our journeys and it is, in many ways, the center of the universe. It’s the heart of our neighborhood. The Hollywood and Western Red Line station is the tip of an iceberg that can’t be neglected or ignored any longer. It is imperative that the many departments that have responsibility for some aspect of development, public safety, homeless services, law enforcement and simple quality of life issues in Hollywood to come together, put down the jurisdictional drama and to simply work together to make Los Angeles a Great City. Hollywood Boulevard is one of the most famous streets in the world and to many people, it's known as the Walk of Fame. But those days are gone as the leadership of Los Angeles gives up on tourism and embraces trucking as the future of Los Angeles. As a sign of that commitment, Hollywood Boulevard is being reinvented as the Truck Stop to the Stars! Tourists come from around the world to walk the Boulevard, starting at LA Brea Gateway and passing the Roosevelt Hotel, Grauman's Chinese Theatre, the Kodak Theater, Ripley's, Madame Tussauds, the El Capitan, the Egyptian, the Pig 'n Whistle, Musso & Frank's, Boardner's...phew! We haven't even hit Vine Street! Keep going and there's the Pantages Theater, the Music Box Theatre, a great view of the Hollywood sign and an equally good view of the Griffith Observatory. It's as if Hollywood Boulevard is the center of the Entertainment Industry universe. Along the walk, there are abundant cafes, restaurants, shops and opportunities to enjoy the local flavor which varies dramatically from one block to the next, featuring a community so diverse that over 100 languages are spoken within the densely populated neighborhood that wraps around the Thai Town and Little Armenia area known as East Hollywood. One would think that such a hot tourist attraction would be guarded and protected by city leadership, celebrated and supported as a valuable heritage that deserves to be nurtured, not just for its economic potential but simply for its cultural legacy and value as an iconic symbol of the entertainment industry that gave birth to to the celebrated community. Granted, Hollywood has had a bit of a roller-coaster past, going from peaks filled with klieg lights & red carpets to lows lit with red lights and inhabited by squatters. Along the way, Hollywood Boulevard lost its claim to fame as the center of the Entertainment Industry. FilmLA Inc., (formerly the EIDC) the company that handles the bulk of the film permitting process for the LA area, gave up its Hollywood digs in order to move to the old Unocal Building in downtown LA. Production companies, post-production facilities, payroll companies, sound studios, rental companies, and studio support of all flavors left town for more hospitable accommodations in surrounding communities. While Hollywood fiddled, local cities such as Santa Monica, Culver City, Burbank, Santa Clarita, and Glendale courted the Industry and facilitated moves that left Hollywood light on production and heavy on blight. Things have now reached the point that even if a local crew member were to get called by a local production company to shoot a film locally, that person would likely be paid by a payroll company located in Burbank or Santa Monica, would likely rent everything from trucks to grip & electric from over the hill, would likely drive to the westside for all post-production, and would likely go to Santa Monica to sell the finished product at the American Film Market. "Local" just doesn't really mean "local" anymore! Of course, Paramount Studios and Eastman Kodak are still in the neighborhood and if the film does well, our local crew member will be able to sit in the grandstands on Hollywood Boulevard to watch the stars arrive at the Kodak Theater to pick up their Academy Awards, so it's fair to say that Hollywood has hung on to some of its glamorous past. Barely! While Hollywood's shine faded and the CRA came in to address the blighted conditions, speculators started circling, waiting for the right moment to dive in with bags of taxpayer money to develop any of the large number of chain-link protected empty lots that litter the Boulevard all the way to Sunset on the east. For literally years the locals and the developers have been engaged in a tug-of-war over the past, the present and the future of Hollywood Boulevard, debating development, revitalization, funding, traffic, infrastructure, community character, and nightclubs. Adding fuel to the fire were and are charges of cronyism, corruption and simple incompetence. In the midst of the brouhaha, Hollywood lost its most valuable commodity, its name! Hollywood is the brand known around the world and Universal City, located just outside of Los Angeles on LA County land, simply lifted it and reinvented themselves as Universal Hollywood, leaving the locals on the boulevard to debate the CRA projects that litter the landscape and promise, at best, a better quality strip mall selling more expensive t-shirts. Apparently, the fix is in, the deed is done and all that remains is for Hollywood to recover, rise from the ashes, reinvent itself, a task that appears to be underway. The Hollywood Chamber of Commerce took a shot at promoting Hollywood as the Capital of Healthcare, an image that is supported by the fact that of the top three employers in Hollywood, two of them are Hospitals! Kaiser Permanente and Children's Hospital edge out Paramount and Sunset-Gower Studios, 8800 employees to 8000 employees, and based on results, often harsh but always fair, the Healthcare Industry has overtaken the Entertainment Industry as the substance of Hollywood. All of which could change quickly, especially if LA's leadership continues to support the Trucking Industry with the bold and cavalier carte blanche and red carpet that they have offered thus far. Hollywood Boulevard is designated as a Major Highway. It ranges in width from 60' at the eastern Laurel Canyon end to 70' at the western Virgil end and it varies in width along the way, getting as wide as 82' at one point. It is referred to as "built-out" by the Transportation Department, meaning that it is lined with historical buildings that prevent the widening or streamlining of the boulevard. 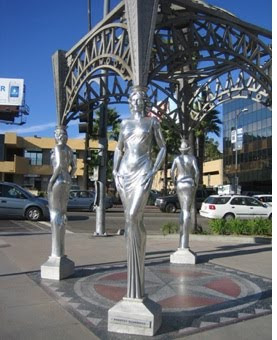 It has three Metro Rail stations between Highland and Western, making this one of the most transit rich boulevards in the City of Los Angeles. And yet, requests for bike lanes and sidewalk widenings are quickly squelched as simply impractical. The current City of LA Bike Plan maps confirm this by simply ignoring Hollywood Boulevard on the surveys and by using the visionary term "Infeasible" when referring to bikeways improvements for the boulevard. After all, "It's simply too 'built-out' and there is no more room!" This has become a popular refrain from the Department of "No!" This position is repeated at community meetings throughout the area while complaints of 18 wheelers parked on Hollywood Boulevard, often for days on end, fall on deaf ears. Calls to Councilmembers Eric Garcetti and Tom LaBonge yield instructions from local deputies on how to dial 311, an exercise in futility that leaves the caller frustrated and the 311 operator confused. 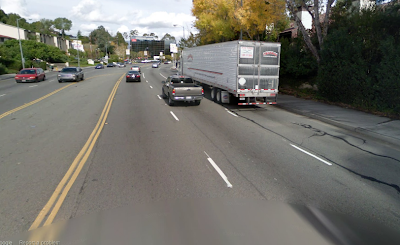 The LAPD defer to the LADOT, the LADOT has been aware of the problem for two years and Chief Jimmy Price himself has claimed that the department is all over it and yet...the Hollywood Boulevard is still an 18 Wheeler Parking lot. The simple secret is this; the parking ticket is cheaper than the off-street parking fee plus the shuttle back home. Locals park 18 Wheelers on Hollywood Boulevard because they can. They can because Garcetti and LaBonge let them. Parking Enforcement Supervisors acknowledge that there is no political will to enforce of parking restrictions for the operators of 18 Wheelers who leave their vehicles on the Boulevard, even when parked under a Tow Away sign. As for the parking enforcement officers, there's simply no motivation to spend an entire shift working on the impound of an 18 Wheeler when during the same time, the same officer can write a full book of tickets. One Supervisor explained "These drivers need to sleep! It's better to let them park on the boulevard than to drive tired." Good logic but not when it impedes traffic, forcing those in the #2 lane on a congested and "built-out" street to merge into the #1 lane to avoid sideswiping the 18 Wheeler. Unless, of course, Garcetti and LaBonge are now reinventing Hollywood as the Trucking Capital and if that's the case, then it all makes sense. With the Healthcare Industry in flux, Garcetti and LaBonge are apparently betting on the future of Hollywood as a Truck Stop. It's the kind of genius plan we've come to expect, although the thought of Garcetti and LaBonge working in sync is a stretch. Regardless, public safety concerns be damned, Walk of Fame be gone, it's time for Hollywood to welcome its destiny, don the Trucker Cap, and embrace the future. Hollywood is now your "Last Stop for Gas!" 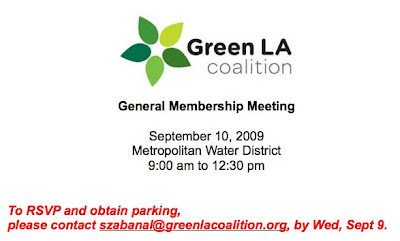 Tomorrow, the general membership converges on the Metropolitan Water District building and, if the Green LA invitation is any indication, they’ll be arriving by private auto and taking advantage of the promised parking. It may be a simple issue, it may seem petulant to point it out but…the promise of parking is, based on positioning, more important than the promise of a robust agenda or an interesting headliner. …citizens can walk to nearby subways, bus stops and light rail stations that will drop them a few blocks from their offices. She envisions seamless bus routes that allow workers to save time and stress in the morning. She envisions a Los Angeles accessible to all residents, no matter their income level or location. She envisions a network of bike lanes that crisscross the city and provide easy access to restaurants and movie theaters. If that vision is going to become a reality, things are going to have to change within the environmental community. 1. The environmental community must start at home and with the little things if it expects the world around it to change. It’s up to the environmental community to establish the standards and to be the first to step up and to embrace the change. 2. Offer an invitation that gives pedestrian, cycling and mass transit instructions on the invitations. Reimburse and reward for the good behavior rather than validating for bad behavior. 3. Take the environmental commitment all the way through the event and make a point at every opportunity. Forgo the ubiquitous plastic bottles of water, pass on the plastic cups, replace the plastic utensils and styro plates and coffee cups and make a real statement with the simple welcome reception. 4. Drive the message in every action, in every communication, in every email, in every opportunity, whether symbolic or significant, it all adds up and it demonstrates commitment. Things are also going to have to change within the City of Los Angeles family. 1. The City of LA will never be the Greenest “Big City” if it doesn’t make some BIG commitments to start with the LITTLE things. 2. When public officials take part in public events, it is imperative that they set a standard for access, for mobility, and for sustainable behavior. 3. With all of the energy spent coordinating schedules, sending bios, fine-tuning agendas and all of the other details that go into planning an event, include in that process a simple standard that the facility and the event meet basic sustainability standards. 4. When the leadership of the largest City in the most populated State in the most powerful Nation in the world put their collective shoulders behind alternative transportation and sustainable events, it will resonate. Tomorrow, the membership of Green LA will arrive at the Metropolitan Water District building, located at the edge of Union Station, and they will enjoy a tasty breakfast. It has been almost 4 years since Green LA formed with the mandate of advising Los Angeles Mayor, Antonio Villaraigosa, and his staff and appointees on how to transform Los Angeles into a national leader in environmental health and equity. If that’s gonna happen, Green LA is going to have to start at home! CityWatchLA - Brisbane has one, LA needs one. What’s the story? At its heart, my Down Under Walkabout was simply a quest to connect with the people and the places that make up my past, my history, and my own personal story. Having started in Melbourne, the Capital of Victoria, then moving through Sydney, the Capital of New South Wales, I finally arrived in Brisbane, the Capital of Queensland, the State where I was born. My visit to Brisbane was a serendipitous journey, as I discovered the “City Machine” exhibit at the Museum of Brisbane (MoB), conveniently located on the first floor of Town Hall. Guests are invited to discover the city by examining the building blocks that make up the complex wholeness and the connectivity that keeps Brisbane humming. In short, Brisbane sets a new standard for Walkabout storytelling. I initially visited Brisbane’s Town Hall aiming low, merely intent on visiting the Council Chambers for a moment or two of reflective contemplation on the inner workings of the city of 2 million and to catch the Lord Mayor and the City Council in action. I was pleased enough to witness a motion to “Adjourn for afternoon tea!” The vote was unanimous and I appreciated the precision with which they concluded a lengthy debate over some monstrous funding issue exactly at 4 pm. But as impressive as that moment in municipal synchronicity and bipartisan politics was for me, the MoB exhibit was what resonated. Overwhelmingly powerful in its effective presentation, it tells Brisbane’s story from the birth of the city, to the organizational growing pains that took it through its childhood, to its maturity as a world-class city, to its future. Archival documents, photos, video, artifacts and relics tell the story of a community that grew in response to both crisis and opportunity, with the first demand being Public Health. The parallels between the origins of Brisbane and Los Angeles are uncanny, with both communities organizing around the Public Works challenge of providing clean water to the residents. In Brisbane, this resulted in the formation of the Public Works Department and in LA, it resulted in the hiring of the first municipal employee, an Indian woman who dipped water from the Zanja Madre and delivered to the local households. Thus was born the DWP. Brisbane’s “City Machine” exhibit takes on the challenging task of turning the dry fodder of archival materials into a fast paced journey from the past to the present and into the future. Starting with simple public health challenges that motivated community organization and then moving to transportation needs, into public safety needs, and then into communications, the MoB puts a spin on the journey that brings it to life and engages the audience. Through it all, it is rapidly apparent that as fast as the tools change, the challenges of a city remain the same. The rapid growth and maturation of the community is constantly presenting infrastructural and organizational challenges that require a highly sophisticated “City Machine” that connects, that communicates, that responds, and that has a clear mandate on purpose and on function and on process. While both Brisbane and LA began with similar challenges and similar responses, it’s painfully apparent that the same “City Machine” metaphor has failed miserably for Los Angeles. This past weekend, LA’s Birthday Party, typically celebrated with a 9-mile walk from San Gabriel to El Pueblo to honor the original Pobladores, was compromised by the poor air quality resulting from the Station Fire. The walk was cancelled and festivities were reduced to the minimum, proverbial icing on the municipal cake, and ironic in timing. As Brisbane celebrates its 150th Birthday with an exhibit that honors the “City Machine,” Los Angeles cancels its Birthday celebration as it grapples with its failure to respond as a "Machine" to the Station Fire. This time of crisis should have been the moment at which Los Angeles came together, functioning as “the Machine,” a complex assembly of many parts working in sync, communicating, connecting and concentrating energy, creating a “wholeness” and providing the leadership of LA with the mechanism to weather the storm. Instead, the local community played a game of “Where’s Tony?” while the many departments of the City of LA followed disconnected mandates that left the locals self-evacuating under the direction and control of multiple agencies, all the while wondering “Who do you call?” as they faced life-and-death challenges. In a situation such as the Station Fire, one would hope that the City of LA would provide proactive and effective communication to the community, instructing them on the roles the many City Departments would play in the management of the emergency, and delivered in a variety of mediums to ensure connection with the community. One would also hope that the Department of Transportation would be on the scene, maintaining a large perimeter to keep the spectators from interfering with the evacuation and with the helicopters collecting water from the reservoir. In addition, it seems reasonable to expect that the LADOT would maintain a tight perimeter in order to keep open evacuation routes and direct local traffic. It would also seem reasonable to have General Services and Rec & Parks on the scene, coordinating the opening of evacuation centers and communicating with the LAUSD so that people, animals and vehicles could be accommodated quickly and efficiently and safely. A City the size of Los Angeles surely has an emergency communication network more sophisticated than a Sheriff’s car with a loud speaker rolling down residential streets, leaving a wake of “What did he just say?” as residents spent more time chasing rumors than in simply coordinating emergency response efforts. Most of all, it seems fair to expect that when the largest City in the most populated State in the most powerful Country in the world is threatened with an emergency the size of the Station Fire, that it would be clear who was in charge, what the emergency plan was and how it was to be implemented. All of which is in dramatic contrast to my experience in the Museum of Brisbane where the City went on record as positioning their ability to mobilize the full force of the city as the culmination of their journey and as the foundation of their vision for themselves as a world class city. So far, my Down Under Walkabout has taken me to Melbourne, which has presented itself as the City on the Move, to Sydney which has presented itself as the City with a Vision, and to Brisbane which has presented itself as the City Machine. As I return to my home in Los Angeles, I find myself asking “What’s LA’s story?” What is the narrative that defines us, that allows us to identify ourselves in the context of our relationship with each other, that connects us with our collective past, with our shared present and with our unified vision for the future. 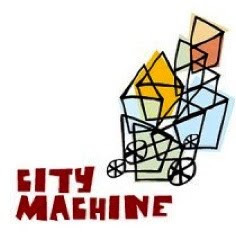 These are challenging times for Los Angeles for many reasons, but most of all because we are in dire need of a leader who can deliver and direct a “City Machine” that functions effectively, with the many complex parts humming in sync, connecting us, and taking us into the future. Los Angeles' Mayor Villaraigosa is the Captain of a ship adrift, battered and tossed by the budget crisis, unemployment, home foreclosures, homelessness, traffic congestion, air pollution, land use struggles, transit controversy and a host of other issues, all sized proportionately for the largest City in the most populated State in the most powerful Country in the World. As Villaraigosa stands on the bridge and looks at the rocks, he also watches as members of his senior staff row to shore, demonstrating with their rapid exits their confidence, or lack thereof, in the direction Los Angeles is headed. Scrambling to muster a team, he has raised more than a few eyebrows with his appointments to fill those empty uniforms and we can only hope that those who answer the call have maps with them and that they stay long enough chart a course that moves Los Angeles in the right direction. Stepping up as Chief of Staff comes the Rev. Jeff Carr, fresh from his successful tour of duty as the "Gang Czar" responsible for "Summer Night Lights," a program designed to confront the problem of gangs and inner city crime, not by declaring war, but by providing evening access to parks and by providing activities to bring people together and to create community. Novel concept! Got the attention of the White House. For 16 neighborhoods in Los Angeles, the two year old program offered "skaters, taggers, rockers, homies, jocks, ballers and, of course, their families" the opportunity to enjoy each others company, supported by "summer squad" park staff along with gang-intervention workers. The program is not without controversy and the actual impact of the program is being debated. The Mayor's office is claiming a 17 percent drop in "violent gang-related crime" and an 86 percent "reduction in gang-related homicides" in "communities surrounding SNL parks." Critics point out that "the final Gang crime statistics, which may or may not give some idea of the success of Summer Night Lights, won't be tallied until AFTER the program ends on September 5." As the debate settles out, it's refreshing to note that under Carr's leadership, the City of Los Angeles stands a fair chance of moving forward under the banner of "Make Parks, Not War!" If the Chief of Staff can take that same mission inside City Hall, we may stand a chance of weathering the storm! Imagine if you will, the warring departments within the City of Los Angeles coming together in a campaign centered around parks. It makes sense! Think of parks as Water Reclamation opportunities and you've got the Department of Water & Power working with Rec & Parks. Think of all of the DWP property that could be utilized for parks, from the huge swaths of land under the transmission lines to the small pocket parks at the switching stations. Landscape and maintain the property with bio-basins for retention and infiltration and we're well on our way to reclaiming water and providing green space, all at the same time. Think of parks as Public Safety strategies and you've got the Police Department working with General Services. Imagine all of the city property that typically sits in a default "off-limits" state, vulnerable to crime while the people of Los Angeles scramble to find public space. Involving the community and putting eyes on the street is an effective technique for reducing in crime and for creating an enhanced sense of community. Think of parks as Air Pollution mitigation and you've got the Ports and Harbor Authorities partnering with the local communities in solutions that resonate, cleaning the air and creating community, providing for healthy bodies and healthier neighborhoods. Think of parks as Emergency Preparedness strategies and you've got the Fire Department working with Rec & Parks. Imagine the people in a community engaged and connected so that in the event of an emergency and an evacuation, they're already acquainted and prepared and know the drill. Think of parks as Sustainable Community tipping points, starting places for a real conversation of sustainability and how it resonates environmentally, economically, educationally and socially. Imagine people (re)thinking their communities and land use and mobility from the perspective of a sustainable and intentional lifestyle and how it all started with a park! Think of parks as educational facilities and a whole new relationship with the LAUSD blossoms, integrating rather than isolating, bringing down rather than building fences, creating partnerships that begin with simple access and linger as the community takes responsibility for education and for the educational facilities. Think of parks so numerous that people actually walk to them, creating street life and contributing to the health of the community. Transportation and Planning now have a whole new application of access and mobility to incorporate into the Community Plans. They might even begin to work together! Think of parks as a foundation element in street standards and Public Works has a whole new approach to laying down Green Streets, Safe Streets, Shared Streets, Complete Streets and Great Streets. To think, it all started with a park! Granted, the City of Los Angeles is facing significant crises and building a Zen garden in my neighborhood is not going to balance the budget or put people to work. But with almost four dozen different departments in LA and enough Deputy Mayors to fill a couple of life rafts, I contend that if the Mayor is serious about citywide solutions that “require new creative thinking,” he start by positioning LA as a Great City of Great Parks. That point of focus gives Chief of Staff Carr the opportunity to direct the full force of the city with a starting point, an end point and a "context specific" approach to working together. 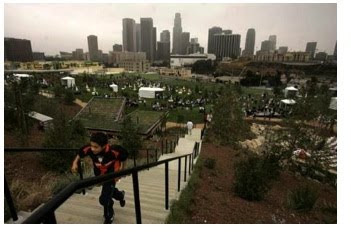 If Chief of Staff Carr can get the Deputy Mayors and the General Managers of Los Angeles to all put their hands out, grab a piece of a park and to simply reposition themselves and their departments in the context of building more parks, I propose that Los Angeles would be well on its way to becoming a Great City, one park at a time. Along the way, we'll solve a lot of problems, we'll create community and we'll become a proactive city! As for me, I'm starting tomorrow, at the Park(ing) Day LA Workshop. We'll be building a park, on Santa Monica Blvd., in a curbside park(ing) space. 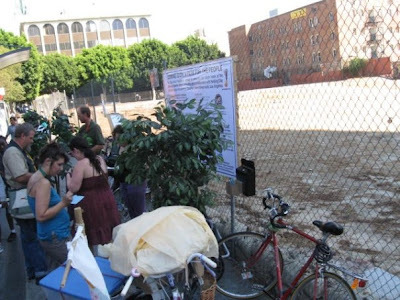 On September 5, 2009 @ 10 am, we will be hosting a Park[ing] Day LA Workshop. The Greensters will be using bikes to transpo supplies to the location (9am load-in, 9:30 ride, 10am arrival) where we will install a simple and basic temporary park as a demonstration project.